My great grandfather was PW Dawkins. I am interested in finding out when and why he resigned from the company. I realize that is was rather early in the development of the company, however, I would appreciate any information that is available. North Carolina Mutual Insurance Co. was established in 1898 as the North Carolina Mutual and Provident Association by John Merrick, Dr. AM Moore, PW Dawkins, DT Watson, WP Pearson, EA Johnson, and Dr. James E Shepard. This coalition of men appears to have grown out of the Grand United Order of the True Reformers, a mutual-benefit society founded in 1881 by William Washington Browne. John Merrick, a member of the True Reformers, helped form the Royal Knights of King David with John Wright, WA Day, JD Morgan, and TJ Jones. As was common in the 19th and early 20th century, fraternal organizations and 'friendly societies' were the source of life, burial, and health insurance. Although the sources I've looked at seem unclear, the Royal Knights of King David were evidently not financially successful in the insurance business, but the relationships therein formed the seed of the establishment of the North Carolina Mutual and Provident Association. John Merrick had been a successful barber in Raleigh, and was evidently, in part, persuaded to move to Durham by Washington Duke, Julian Carr, and WT Blackwell. Once in Durham, he established a successful barbershop business as well as a real estate business - evidently assisted by a loan from Julian Carr. Dr. Aaron Moore had moved to Durham in 1888 to begin his medical practice - the first African-American physician in Durham. CC Spaulding was a nephew of Dr. Moore and became first an agent for the company, and then, quickly, chief of agents. The company struggled initially, and the first death claim of $40 necessitated an additional capital infusion from the stockholders to keep the company afloat. The initial financial troubles of the company caused all organizers except for Merrick, Spaulding, and Moore ("The Triumvirate") to resign. However, the three men were successful in keeping the business afloat, and "using sound scientific principles" building a prosperous company. 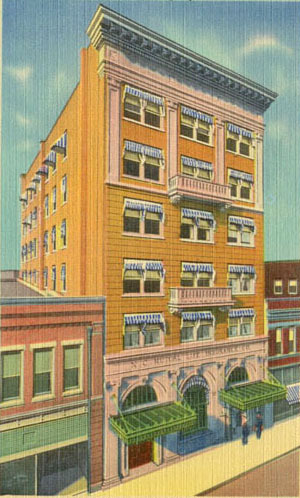 The insurance company was first located in Dr. Moore's office on Main St., at the site of the "old courthouse". Parrish St. was transitioning from tobacco warehouses to commercial structures. In 1906, the NC Mutual and Provident Assn. built their own office building, just to the right of the Christian-Harward building in the above picture. Looking northeast from Parrish St., 1911. The insurance company offices were located on the second floor, while the first floor was rented to a shoe store and a clothing store. 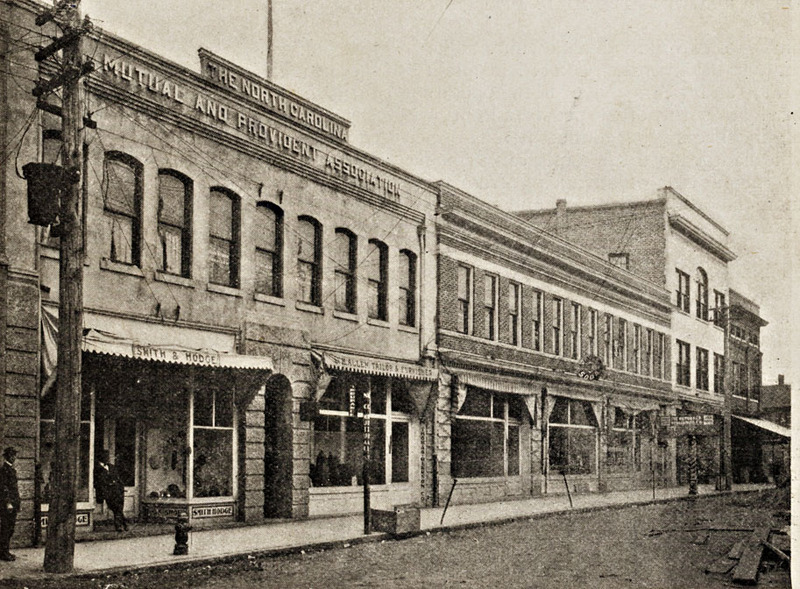 By 1907, the principals had started Mechanics and Farmers bank, located in the same building. Both the insurance company and bank were quite successful. John Merrick was the first president; after his death in 1919, Dr. Aaron Moore became president. In 1921, the company had grown to such an extent that the existing building on Parrish St. was not large enough. It was demolished, and an impressive neoclassical revival building - similar in style to the First National Bank building at W. Main and Corcoran - was errected in its place. 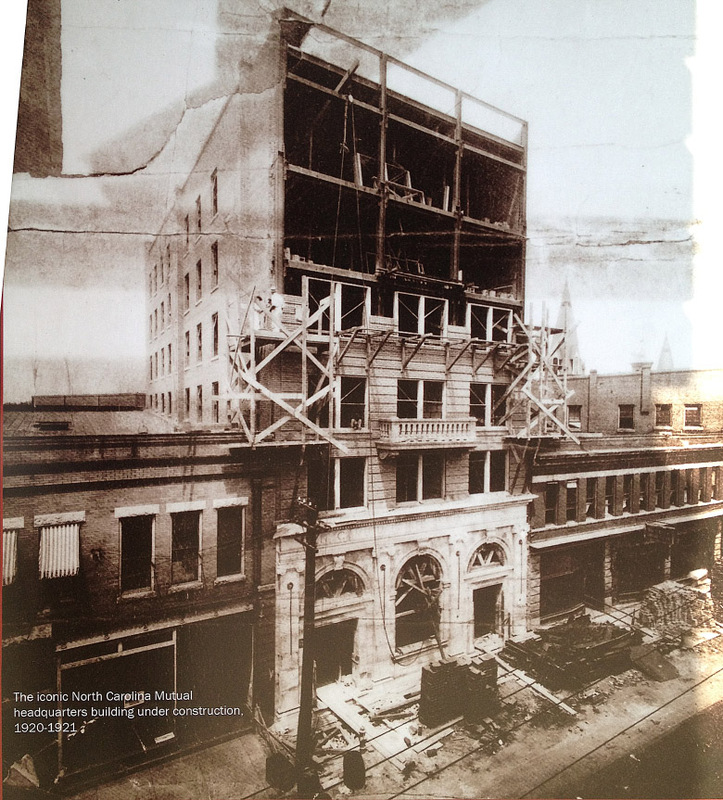 The six-story structure was designed by local architects Rose & Rose. A view of Parrish Street, looking northwest, 1924. 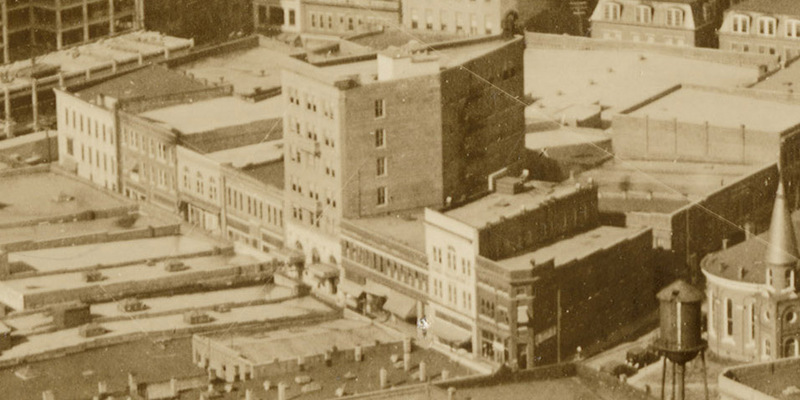 A view of the North Carolina Mutual building, looking northeast, 1920s. Mechanics and Farmers Bank was located on the first floor, Bankers Fire Insurance Company (organized as a separate division in 1920) on the second floor, and NC Mutual the remaining four floors and the basement. After Dr. Moore died in 1923, CC Spaulding became president, a post he would hold for the following 29 years. Above, two views of the building - the one on the left from the 1920s, the one on the right from the 1930s. Note in the second that the Christian-Harward building next door has added a third story. CC Spaulding built an ever more successful company, as did the presidents following his death in 1952. By the 1960s, the insurance company had outgrown its Parrish St. building as well. Above, a view of the first floor of the NC Mutual building, 1963. The original windows had been replaced by jalousie windows. NC Mutual purchased Four Acres, BN Duke's former mansion, and constructed a 12-story international-style structure in its place in 1965. While the insurance company moved to this large new structure, Mechanics and Farmers Bank remained in the original building on Parrish St. The "North Carolina Mutual Life Insurance Co." lettering on the facade was replaced by "Mechanics and Farmers Bank." The original awnings and entrances were removed - the two side entrances were filled, and a modern, single canopy entrance was put on the building. At some point later - I'm not sure when, the building underwent restoration, including replacement of the jalousie windows with more historically appropriate sash windows. Unfortunately, the restoration did not include the original entrance.